President Trump threatened yesterday to cut off aid to any country that votes today against the U.S. decision to recognize Jerusalem as Israel's capital. The vote takes place today at the emergency special session being convened at the United Nations General Assembly, called for by Turkey and Yemen (via Iran). This vote follows the announcement of Dec. 6, when Trump fulfilled his campaign promise to recognize Jerusalem as the capital of Israel and directed the State Department to begin the process of moving the U.S. embassy there. But more than that, Trump's recognition acknowledges the underlying problem of the past 30 years of diplomatic efforts: recognizing reality. The Jerusalem announcement was a preview of President Trump's larger vision of operating within reality, a central theme in the subsequently released National Security Strategy. On Jerusalem, it acknowledges that "Israel is not the cause of the region's problems," and accurately blames regional instability on Iran and jihadist organizations. This administration is the first in American history to so explicitly break from the false causation drawn between Israel's existence and the problems of the region. The rejection of this lie is long, long overdue. Trump is the first U.S. president to explicitly reject the false causation drawn between Israel's existence and regional problems. Further, while reflexively dismissed by pundits and foreign governments, the Jerusalem announcement may well be a helpful step in negotiating the "deal of the century" if it is properly leveraged. The Palestinian leadership still wages the war that the Arab countries started 70 years ago upon the approval of the UN partition plan, which is a genocidal aim to destroy, rather than promote, peace. Only with an Israeli victory over rejectionist enemies — including Palestinian leadership along with Hamas, Iran, and Turkey — will the conflict end. History has shown that lasting and meaningful peace between Israelis and Palestinians will not come through negotiations. More likely, peace will arrive when one side gives up its goals. Israel is nearly 70 years-old, and the only example in the Middle East of a modern, successful, free, and democratic country, one in which all minorities — including its substantial Arab population — are citizens with full rights. Meanwhile, Palestinian leaders, with the support of Iran, Turkey, and Qatar, have created an authoritarian kleptocracy that suppresses the rights of everyday Palestinians and is myopically working towards, in their words, the central goal of driving the Jews into the sea. It's in America's interest that the Palestinians give in to Israel's vision, not the other way around. 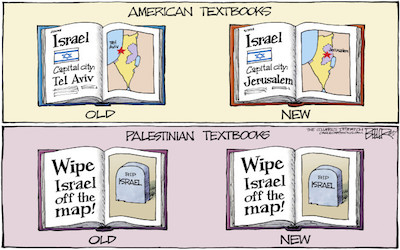 It's in America's interest that the Palestinians give in to the Israeli vision, and not the other way around. A second example of the National Security Strategy's recognition of reality is the usage of the terms "Islamist," "Jihadist," and "Shariah" a combined thirty-seven times, which stands in stark contrast to former President Barack Obama's National Security Strategy in 2010 and 2015 and President George W. Bush's in 2002 and 2006, none of which used those terms at all. This terminology was scrubbed from our lexicon during the Bush administration for political reasons and has led to disjointed and often ineffective policies in addressing the ideological threat, which is the root of jihadist terrorism. The Obama and Bush administrations did not want to give credence to jihadist claims (through Al Qaeda, Al Nusra, Al Qaeda in the Arabian Peninsula, the Islamic State, etc.) that the U.S. was waging a war against Islam. 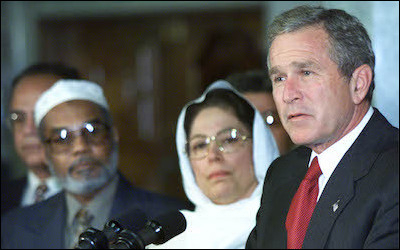 Terms like "Islamist," "Jihadist," and "Shariah" were scrubbed from the official U.S. lexicon under President George W. Bush. This was commendable, but not to the point of neutering our ability to accurately identify the enemy and its doctrine. Whether they are misguided or strict adherents, what matters is that they truly believe in this jihadist ideology and are willing to die in order to commit atrocities. If we continue to be blinded by political considerations, our national security apparatus, whose mission it is to ensure Americans are kept safe, is rendered ineffective. On Monday, President Trump announced we would no longer be hampered by our prioritization of wishful thinking over recognition of reality. This unexpected and unorthodox change in national security policy has many on edge, but it should be embraced, not condemned. Previous administrations failed to comprehend the jihadist threat and what really holds Israelis and Palestinians back from peace. Previous administrations have failed to comprehend the reality holding Israelis and Palestinians back from peace, and the conflict has persisted, costing far too many lives. These same administrations have refused to acknowledge the reality of the jihadist threat, and countless people around the world have paid the price with their lives. Trump's new strategy document also takes reality into account when addressing other enduring threats like North Korea and Iran. The breaks it takes from past failed policies is not only pragmatic, but promising. Reality may seem like a scary place, but it's where our enemies live. It's time for us to live there too. We can't defeat them from the clouds. E.J. Kimball is the director of the Israel Victory Project at the Middle East Forum.